Caltech’s Climate Dynamics Group studies atmospheric dynamics, both here on Earth and on other planets, on scales from clouds to the globe. We aim to elucidate fundamental questions about climate such as, What controls the surface temperatures and winds? What shapes rainfall patterns? Where and when do clouds form in the atmosphere? 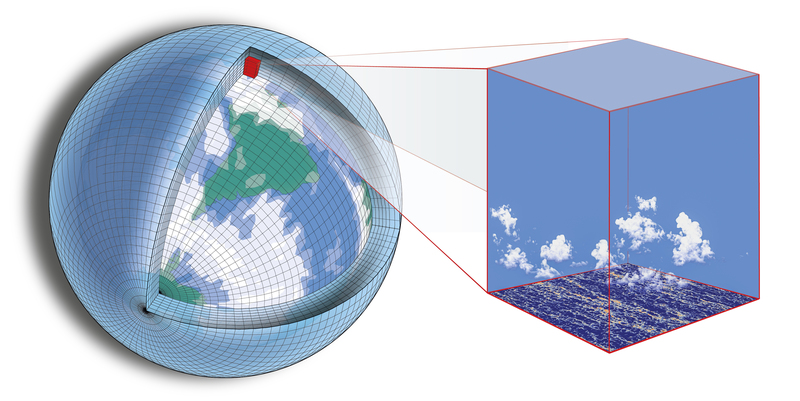 To answer such questions, we analyze observational data and perform systematic studies with numerical models, with which we simulate flows ranging from the meter-scale motions in clouds to global circulations. Thanks to the availability of unprecedented observations from space and ever increasing computational power, ours is the age in which the physical laws that govern climate as an aggregate system will likely be discovered. Our goal is to contribute to that discovery. We strive to translate scientific discoveries into improved models for weather forecasting and climate prediction. The same observations and numerical tools that enable new scientific discoveries have the potential to transform modeling of the climate system. As part of the Climate Modeling Alliance (CliMA), we are contributing to the development of next-generation models and model components that will allow us to predict the climate system more accurately. Novak, L., T. Schneider, and F. Ait-Chaalal, 2019: Midwinter suppression of storm tracks in an idealized zonally symmetric setting, Journal of the Atmospheric Sciences, submitted. Schneider, T., C. M. Kaul, and K. G. Pressel, 2019: Possible climate transitions from breakup of stratocumulus decks under greenhouse warming. Nature Geoscience, 12, 163–167. Garbuno-Inigo, A., F. Hoffmann, W. Li, A. M. Stuart, 2019: Gradient Structure of the Ensemble Kalman Flow With Noise, SIAM Journal on Applied Dynamical Systems, submitted. Ferreira, D., P. Cessi, H. K. Coxall, A. de Boer, H. A. Dijkstra, S. S. Drijfhout, T. Eldevik, N. Harnik, J. F. McManus, D. P. Marshall, J. Nilsson, F. Roquet, T. Schneider, R. C. Wills, 2018: Atlantic-Pacific asymmetry in deep water formation. Annual Reviews of Earth and Planetary Sciences, 46, 327-352. Simulation of cumulus clouds under conditions observed during the Rain in Cumulus over the Ocean (RICO) field campaign. Within the gray volume, there is cloud liquid water, simulated with the PyCLES code developed by Kyle Pressel et al. Blue colors indicate rain. The simulation uses 5th-order weighted essentially non-oscillatory (WENO) schemes for discretization of all fluxes (of momentum, entropy, and total water), at a resolution of 50 m in the horizontal and 40 m in the vertical.